Barton A. Myers is Associate Professor of Civil War History at Washington and Lee University and the author of the awarding winning Executing Daniel Bright: Race, Loyalty, and Guerrilla Violence in a Coastal Carolina Community, 1861-1865 (LSU Press, 2009), Rebels Against the Confederacy: North Carolina’s Unionists (Cambridge Univ. Press, 2014), and co-editor with Brian D. McKnight of The Guerrilla Hunters: Irregular Conflicts during the Civil War (LSU Press, 2017). Dr. Myers received his B.A., Phi Beta Kappa from the College of Wooster in Wooster, Ohio and his M.A. and Ph.D. from the University of Georgia. 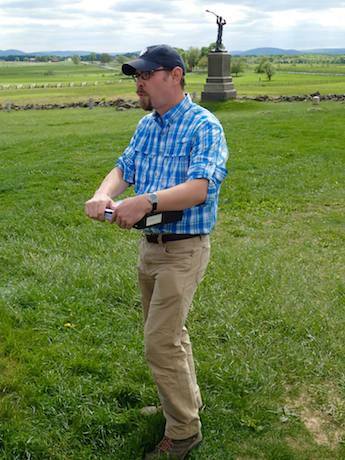 Professor Myers has taught at Cornell University, the University of Georgia, and Texas Tech University, and before becoming a professor, served as a public historian with the National Park Service at Fredericksburg and Spotsylvania National Military Park where he led tours of some of America’s most historic battlefields. Currently, he teaches a number of popular American military history and public history courses including his intensive battlefield travel course “The Art of Command during the American Civil War.” He is also a past nominee for the Rising Star Faculty Award given by the State Council of Higher Education for Virginia. Dr. Myers is a recipient of prestigious grants and fellowships from the Harry Frank Guggenheim Foundation, the Andrew W. Mellon Foundation, the Marine Corps Historical Center, the Filson Historical Society, the Virginia Historical Society, and the Jack Miller Center for Teaching America’s Founding Principles and History. He speaks widely to Civil War groups and roundtables around the United States. Dr. Myers’ work has been featured in the national media, including the Los Angeles Times, the Richmond Times-Dispatch, Smerconish.com, Sirius XM’s “The Michael Smerconish Program”, CSPAN’s “American History TV”, National Public Radio’s Virginia Insight, and the Civil War Monitor. He lives in historic Lexington, Virginia in the Shenandoah Valley.